This time we are not talking about the endangered wild horses of America. The many problems concerning the Mustangs are already at the focus of attention and discussion. 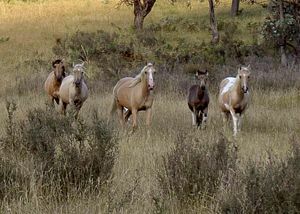 Today we will concentrate on the wild horses of Australia: The Brumbies. Perhaps we don’t realize it, but – apart from a real kangaroo we are most likely to come across wild horses when we are in the outback of Australia. Most of the Brumbies live in the still sparsely populated north of the continent, so that you would probably encounter them in Queensland and Northern Australia. As they have always been on their own, they have learned to take care of themselves. They live their life in a herd, and this stable structure with firm rules ensures that they help each other at all times. 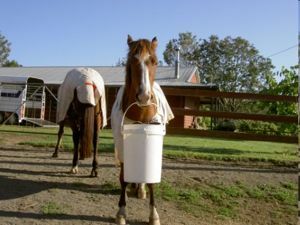 This self-help has a second, equally important component: These horses have learned to propagate continually. 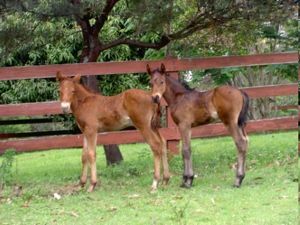 DNA tests have shown that Brumbies go about it with a great deal more intelligence than some thoroughbred horse breeders: Inbreeding is much more widespread in thoroughbreds than it is in these isolated wild horses. But this is only one of the arguments why these horses are being assigned a special intelligence. As a wild horse it has to learn how to survive in a world full of humans who are shaped by market economy. To find the way in an ever changing environment takes real sophistication and well-developed perception. Their eyes tell us of the strong will power and singular temperament that they exhibit. Their body language tells of constant alertness and strength. 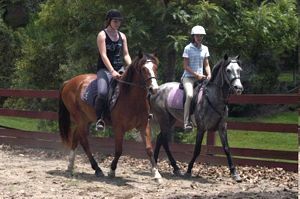 Watch the video…… These horses are said to be extremely agile, fast, and wild, demonstrated by their flawless conformation, strong bones, and very sturdy hooves. fluctuations that exist in Australia. In the summer months they lived in driest heat, during the winter in bitter cold. Only the toughest horses could withstand these extreme conditions, along the phrase “survival of the fittest”. The wild horses probably have their name from Sergeant James Brumby. He was one of the first settlers on this “new” continent and left his horses to the Australian bush when he transferred to Tasmania. By the sheer will to live these horses learned to take care of themselves and became known more and more for the their endurance and resilience. Because of these traits mainly Brumbies were deployed in World War One and Two and many of the wild horses lost their lives in the war. does not feel responsible in this matter and simply will not intervene. While this unique horse breed is moving closer towards extinction very few are willing to face the problem. Apart from a few small horse rescue organizations only “Save the Brumbies Inc” has taken up the cause to save these horses. The future looks bleak for the Brumbies despite their importance for the horses of this world. Up until now the north of Australia has been mostly unpopulated. At this point though, human settlements are getting denser and can’t be stopped. The habitat of the Brumbies is shrinking continuously and there is less and less room for them to feel safe. 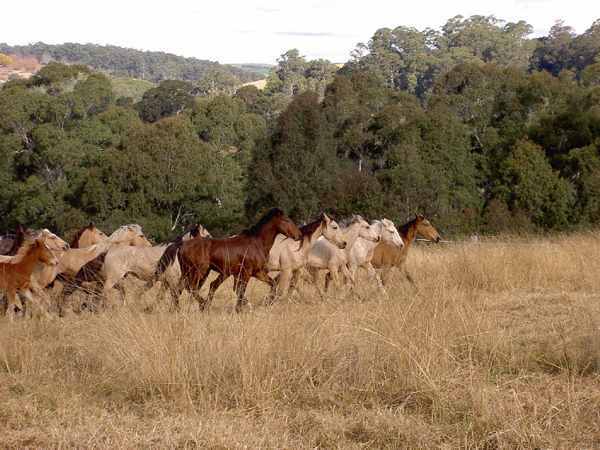 The Brumby could become an important link to the horses in our stables: As our horses are getting more fastidious and lose a real sense of freedom that the wild horse has, crossbreeding with the Australian Brumby could put renewed temperament, will-power, and endurance into the domestic breeds. If the hunters really succeed in bringing the Brumbies to extinction, important genetic information would be lost with them and couldn’t be retrieved any more. therefore, to control the wild horse population. 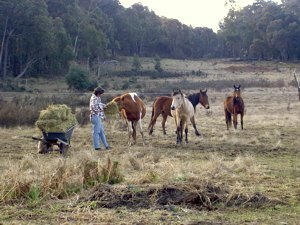 Apart from creating sanctuaries, the horse relief organization has introduced a Brumby adoption program. 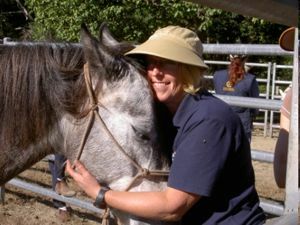 After a thorough assessment horse lovers can adopt a Brumby, thereby helping to preserve the breed. These horse rescuers have already helped a great many Brumbies as is attested in a few really moving stories. Just as any relief organization, they depend on outside help and are grateful for any donation. Please help, as others do, to save die wild horses and protect them from extinction! After all, it is a matter of it preserving a unique horse breed and therefore concerns all us horse lovers. hahahaha what a coincidence because i live in australia and i see brumbies most of the time because i live on a hill and i always see wild ones galloping across the feilds. its sooooo beautiful whenever i see them i take a photo. i also have 3 horses of my own there names are henry, jedda and lilly. Hi, I believe there was only one cavalry horse that returned home to Australia, after serving in World War One 1914-18, and his name was Sandy. Was Sandy a brumby.? How old do wild brumbies usually live for?